Chart No. 25 - Contacts Above Poupart's [Inguinal] Ligament to Carry Impulses Across to the Opposite Shoulder. Illustrated Therapy for Charts 9 and 10. 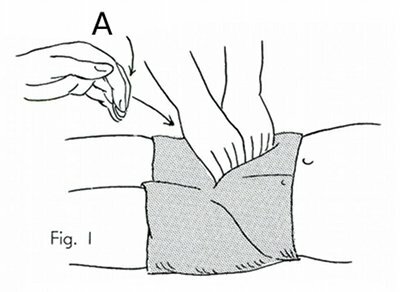 (A) The hand illustrates the finger tips [fingertips] made even for the contact so it hurts less and gets an even pressure on the deeper muscles. A deep contact in the iliac fossa just above Poupart's [inguinal] ligament. After relaxing the superficial abdominal muscles the objective is the release of the psoas magnus [psoas major] and iliacus muscle and pelvic blocks. The direction of the arms is toward the opposite shoulder which the operator faces. It affects all the organs above it in that line, especially the stomach. 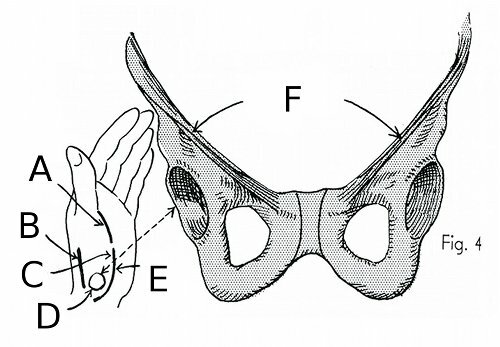 A fist and knuckle contact in the same area for the release of the superficial muscles. It is general and less penetrating but very effective if properly done. A gentle contact first, then steady and specific directional pressure upward until the tissues under the contact relax and reflex that release along the line of force toward the opposite shoulder. The same purpose contact made with the thumbs of both hands. The right thumb is making a specific contact on the rectus abdominales [rectus abdominus] muscle just above the pubis. The thumbs make a softer contact than the finger tips [fingertips] and get a good hold on surface muscles. Direction is posterior and diagonally superior like the other two contacts shown here. When these areas do not respond - find the perineal reflex which controls spasms of intra pelvic [intrapelvic] muscles and leg reflexes. A clear picture of the anterior pelvis and Poupart's [inguinal] ligament to clarify the area of contacts above it and along it's [its] course from the anterior superior spine of the ilium [ASIS] to the symphisis pubis [pubic symphysis]. Anteriorly this is the negative pole to the neuter [neutral] diaphragm and the superior shoulder girdle of the trunk. These groin areas have a powerful reflex as basic areas to the superior diagonally via the polarized brain currents of the caduceus in a straight line thru [through] the electro-magnetic [electomagnetic] forces blending in with gravity.